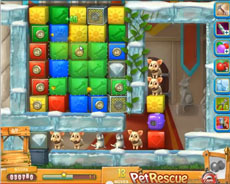 Pet rescue 468 is one of the most difficult leves in the new episode. You have to release the pets from their pet boxes at the right of the screen where possible and then clear blocks at the left part of the screen to activate the line blaster. Use this booster in the penultimate line to destroy the metal boxes. Repeat the same procedure in order to activate the line blaster and use it in the last line to rescue the pets. The moves are really few to activate the line blaster as many times as is needed to rescue the demanded number of pets and you have to be lucky to make it, without a booster (like a hammer). For those of you that find it tough to beat Level 468 why don’t you spend 2 minutes to watch the video below? You don’t need a hammer or other booster to complete this level. You will need to get four line blasters though. As Michelle states, clear blocks on the left until you get a line blaster, then use it on the bottom row on the right – the one with two crystals, a block and a pet, the row just above the row of metal blocks in the “tunnel”. Then you can free the rest of the pets on the right without using a line blaster. Once the pets are free, keep clearing blocks on the left until you get a second line blaster. Use this line blaster on the row of metal blocks in the “tunnel”. Clear blocks on the left again until you get a third line blaster. Use this in the “tunnel” to clear any remaining blocks between pets (there should be two). Clear blocks on the left again until you get the fourth line blaster, and use this line blaster on the remaining metal block at the mouth of the “tunnel”. Depending on how “generously” the blocks on the left drop and line up, you will have very few (if any) moves remaining at the end – I finished with only one move left. thanks so much for the detailed feedback! actually we beat it with no hammers.. but we feel you.. it’s quite tough.. ! !